The transmission efficiency of the vacuum window of CCD and EMCCD cameras is a key consideration when optimizing the performance of the system for a particular spectral region of interest. Generally one wants to maximise the transmission possible in the desired wavelength region. Careful design and use of anti-reflection (AR) coatings on both surfaces of the window can minimise reflection losses at each surface leading to enhanced transmission compared with the bare uncoated substrate. However, there is often a trade-off between enhancing performance in a specific wavelength region, and having good efficiency over a broad band (BB) or large wavelength range. Hence there are cases where the uncoated substrate may be a better option, particularly if one wants to maintain good transmission from the UV right up to the SWIR region. Another key consideration in some applications is the minimization of any fringing effects due to the window; this effect is directly related to the coherence of the light incident on the camera. Fringing effects can occur due to the etaloning effect within the window substrate. This can appear as faint fringing lines superimposed on the image or spectrum. It is due to constructive/destructive interference effects and can occur when dealing with coherent light sources, particularly for those wavelengths in the NIR above ~700 nm. Using a wedged window is a good way of reducing the effect to minimal levels; the wedging helps to break up the coherence of the interfering light waves. Figure 1: Transmission curves for different window options showing the optimized spectral regions over which the window is most appropriate. There are two materials selected for use in the windows of Andor cameras: UV Grade Fused Silica and Magnesium Fluoride. UV Grade Fused Silica (FS): UV grade fused silica is formed from silicon dioxide. It is a synthetic non-crystalline amorphous material which offers good transmittance in the NIR, visible and UV regions down to 180 nm. Whilst quartz consists of silicon dioxide as well, its structure and performance is significantly different; quartz is crystalline and shows birefringent properties. The homogeneity and transmittance is better for UV grade fused silica. Fused silica has a high damage threshold and is often used when working with high power lasers. It can also offer good transmission up into the IR region to beyond 2 μm. Magnesium Fluoride (MgF2): MgF2 offers both good transmission into the deep UV or VUV region and up into the SWIR region. It is used mostly for UV optics and can transmit down to below 120 nm. However MgF2 is slightly birefringent so windows are normally manufactured so that the c-axis is parallel to the optic axis of the system and therefore perpendicular to the plane of the window. It can also transmit up to beyond 7 μm in the IR region so is commonly used as the material of choice in SWIR region. VUV grade material is used for the Andor windows. As it has a low refractive index it has a high transmission over the whole spectral range even without the use of AR coatings; the addition of an AR coating whilst possible offers little improvement to this already high transmission. MgF2 is more expensive than fused silica. Figure 1 shows the transmission curves for the different window options available. Two of these correspond to the raw Magnesium Fluoride (MgF2) and UV Grade Fused Silica (FS) substrates with no AR coatings and the others are for windows with optimized AR coatings on both sides of the substrate. The meaning of the descriptive codes used is explained in Table 1. Table 1: Summary of the different types of window option available corresponding to the transmission curves shown in figure 1. The Symbols Key at the bottom summarizes the abbreviations used. The corresponding transmission curve is shown in Figure 1 as a solid red line and labelled “VIS-NIR Enhanced”. A summary of the dimensional data and wedge characteristics for each window is given in Table 3 and Figure 3 of Appendix B. Figure 2 summarizes the options possible for constructing a code to specify a particular window. An example is illustrated for a window which may be used with the Newton camera for optimization across a broad visible to near-infrared range – ‘Broadband VIS-NIR’, and which is wedged to minimize any chances of etaloning: the corresponding new window code would be: ‘WN45FS(BB-VS-NR)W’. Note that not all possible combinations of window features are desirable and consequently not all combinations are offered. The different window options for each camera model are given in Table 2 of Appendix A. Generally if one is choosing a sensor with QE optimized for a particular spectral region, they will also consider choosing a window optimized for the same region. One should consult the individual specification sheets for each camera to see the standard window offered and the additional options available for it; also refer to the table in Appendix A of this technical note. The standard window (S) will satisfy the majority of situations, and has been chosen to give the best performance for the broadest range of applications. However, other options (O) for applications requiring specifically optimized conditions are readily available without requiring a >Customer Special Request (CSR). These options are offered in the Camera Windows Supplementary Specification Sheet. In the very small number of remaining cases where a particular window performance is required these will be handled through the CSR process. There are situations where it is not feasible to put particular windows on to particular cameras for technical reasons and these are denoted as ‘non-applicable’ (n/a) in table 2 Appendix A. For example wedged windows of 60 mm diameter cannot be fitted to Standard iKon-L cameras due to mechanical constraints. Similarly as another example, putting a window optimized for the ‘NUV-Enhanced’ region on to an iDus front illuminated (FI) camera would be a mismatch for overall sensitivity. The customer special request (CSR) process is still available to service requests for the very small number of windows not likely to be covered by those outlined here. For example, an application area where there may be very specific wavelength requirements is Bose-Einstein Condensation analysis. 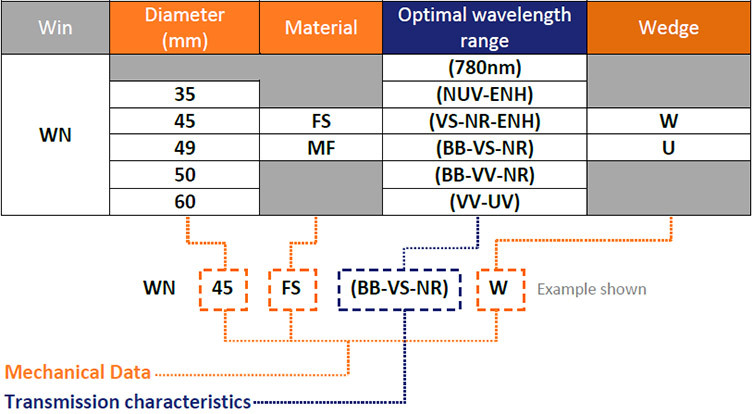 There are two specific window options offered up front – namely ‘Bose-Einstein 780nm’ chosen for the most common wavelength used, and the ‘NUV Enhanced’ window which offers optimization for several wavelengths in the UV, such as 369 and 421 nm. It is also worth noting that the window for ‘VIS-NIR Enhanced’ can be used for the multiple wavelengths of 670, 767, 780 and 850 nm. However, if a window with the necessary requirements is not available, then the standard CSR process should be followed and the particular requirements outlined. For OEM customers, the OEM Sales Engineer should request a unique camera code if an optional window is required. Determine the wavelength region or regions of interest for optimized throughput. Refer to the transmission curves – Figure 1 – for the different window options. Consider the best combination of window with sensor QE against the spectral regions chosen for optimized throughput – refer to QE curves in Specification Sheet. Refer to Table 2 in Appendix A for the various options available for the particular camera model under consideration. If the window needed is the standard (S) window– then just select the camera model as indicated on the Specification Sheet. If another window option (O) is needed– then a separate line item is needed on the order detailing the option as per the options presented in the Camera Specification Sheet. The separate line items corresponding to the options can be entered automatically when constructing a PO or quotation. If the required window is not available as a standard (S) or an option (O) – then a CSR will need to be raised. The specific requirements should be outlined when raising the CSR request and creating the CSR ticket. It is recommended that one discusses the detail with an Applications Specialist at this point. Figure 2: Guide to constructing window code. Note that not all possible combinations are available or desirable. Refer to list in Appendix A for options available for each camera model. Schematic for dimensions of (a) Unwedged and (b) Wedged windows for the different cameras. (AR coating: inside diameter denoted by φ1, outside diameter denoted by φ2).